April is all about sunny weather and the flowers have turned from buds to blooms. But despite the sunny weather, those April showers require you to take an umbrella on that picnic, just in case! April is not only associated with showers, the first day of April is April Fool’s Day, a day that many look forward to and others dread. April Fool’s day is a day where people play harmless practical jokes on friends and family members, and if you’re a media person you might sneak in an improbable story in the news or prank a famous person on TV so that the joke goes national! There have been many theories of how April Fool’s day came about – it is said to have originated in Ancient Roman times. Roman citizens used to hold a festival known as Hilaria, to celebrate rebirth and commemorate Cybele, the goddess who enabled her admirer, Attis to be resurrected. 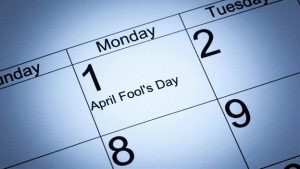 April Fool’s day is known for its pranks – both harmless and sometimes harmful, and if you do prank others, make sure that you consider if it is potentially harmful or cruel in any way, and how you would feel if you were at their end of the joke. Harmless fun is the best kind of fun for everyone. Insect Lamp – Cut out insect shapes with black paper and place them on the inside of a lampshade. When the lamp is turned on the insect will scare the intended person. Air Horn Seat – Attach an air horn underneath an office seat and watch the person jump sky-high when they sit down. Caramel Onion Toffee Apples – Make toffee apples by using onions on the inside. It will definitely be a strong flavor when eaten. Mentos Ice Bombs – Take Mentos mints and freeze them in ice cubes. Serve them to friends who love soda and watch their soda explode. April 22 is known as Earth Day. Earth Day originated back in 1962 and has become a significant global event. Earth Day represents the protection of Earth and is celebrated in over 192 countries. Earth Day is a time when you can honor the earth by making small environmentally sound gestures, in many different ways. The following are some things that you can do on April 22. Earth Day is important. There is only one planet we live on and if we don’t help to preserve it we leave a less stable, safe, beautiful world for our children. Happy April!